"Literary criticism, as I attempt to practice it," writes Harold Bloom in The Anatomy of Influence, "is in the first place literary, that is to say, personal and passionate." For more than half a century, Bloom has shared his profound knowledge of the written word with students and readers. 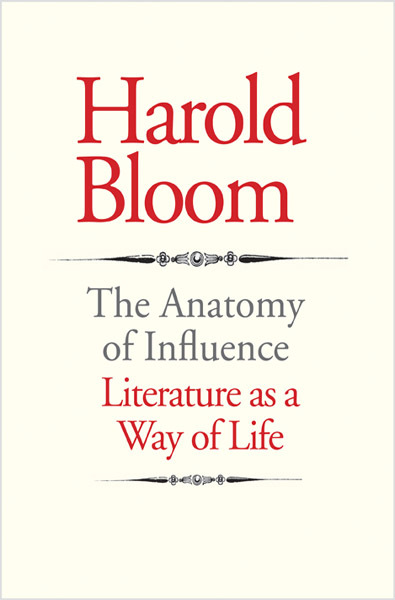 In this, his most comprehensive and accessible study of influence, Bloom leads us through the labyrinthine paths which link the writers and critics who have informed and inspired him for so many years. The result is "a critical self-portrait," a sustained meditation on a life lived with and through the great works of the Western canon: Why has influence been my lifelong obsessive concern? Why have certain writers found me and not others? What is the end of a literary life? Featuring extended analyses of Bloom's most cherished poets—Shakespeare, Whitman, and Crane—as well as inspired appreciations of Emerson, Tennyson, Browning, Yeats, Ashbery, and others, The Anatomy of Influence adapts Bloom's classic work The Anxiety of Influence to show us what great literature is, how it comes to be, and why it matters. Each chapter maps startling new literary connections that suddenly seem inevitable once Bloom has shown us how to listen and to read. A fierce and intimate appreciation of the art of literature on a scale that the author will not again attempt, The Anatomy of Influence follows the sublime works it studies, inspiring the reader with a sense of something ever more about to be.